338 pages | 101 B/W Illus. 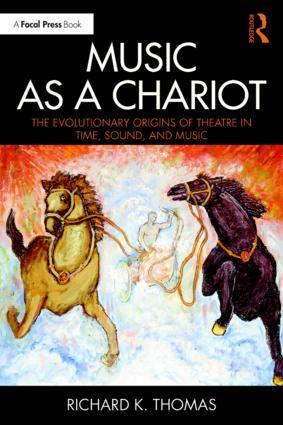 Music as a Chariot offers a multidisciplinary perspective whose primary proposition is that theatre is a type of music. Understanding how music enables the theatre experience helps to shape our entire approach to the performing arts. Beginning with a discussion on the origin and nature of time, the author takes us on an evolutionary journey to discover how music, language and mimesis co-evolved, eventually coming together to produce the complex way we experience theatre. The book integrates the evolutionary neuroscience of the human brain into this journey, offering practical implications and applications for the auditory expression of this concept—namely the fundamental techniques artists use to create sound scores for theatre. With contributions from directors, playwrights, actors and designers, Music as a Chariot explores the use of music to carry ideas into the human soul—a concept that extends beyond the theatrical to include film, video gaming, dance, or anywhere art is manipulated in time. Chapter 1: Introduction: Why this Book? Chapter 4: What Is Music? Introduction: What’s in a Name? Introduction: "All Theatre Starts with a Script"
What is Consonance and Dissonance? Richard K. Thomas is Professor of Visual and Performing Arts at Purdue University with over 100 credits as a composer, sound designer, author, playmaker and educator. He is a Fellow of USITT, and winner of the 2018 Distinguished Achievement Award in Sound Design and Technology.